Not even switching from pumping iron to pumping out Sun Salutations will do it. If working on your body would make you enlightened, all the joggers and weight lifters would be on their way to enlightenment. You must also engage your mind in your spirituality or your mind will hold you back. As powerful and reliable as the poses are, your mind is the primary cause of your physical tensions. You tuck your tail under like a frightened puppy with every stress, every worry, and every fearful thought. Consider how many of these thoughts do you have in a day. Could you ever do enough asana to counter them? I’ve experienced my mind’s ability to tighten my body all too many times. Once at the end of a class, I rolled on to my side after Shavasana feeling so wonderful: relaxed, peaceful, content, at ease. I stood up to leave, looked at the time and realized that class had run late and I’d be late for the babysitter. Before I knew it, my tailbone tightened and I was practically back to square one – the contentment and ease disappeared. All it took was a thought. When class ends, you still have to deal with your mind. It’s wonderful that yoga offers more practices for your mind than the number of physical poses. Mantras, chanting, sutra study, seva and vichara (self-examination) free you from old mental and emotional patterns. This means your mind won’t tuck your tail under again. While the Sanskrit word “asana” is familiar, usually defined as “pose,” it has very ancient roots. In the many versions of Sanskrit over five or more millennia, the meaning and use of “asana” has remained the same. It means “to sit.” Patanjali says your seated pose must be “sukha” (literally meaning sweet, which is relaxed and comfortable) and “sthira” (steady, motionless). The physical benefits you gain from your other asanas make you able to relax into your upright seated position without slumping or wiggling. As you settle in your seat, your body and breath settle into stillness, bringing your mind to stillness as well. That’s the doorway into meditation, the ultimate yogic practice. Meditation makes you new again. Your inner immersion dives into more subtle and expanded levels of your Self. You become the vibrant, peaceful, whole, complete, joyful you that you always wanted to be, because it’s who you really are. It’s who you have always been, just behind the churning of your mind: svaroopa, your own Self. Asana is a great start towards discovering what is and has always been there – your own Divine Essence, hidden within you. But it’s just a start. A baby step. To get the rest of what yoga promises, you have to stop moving. Think of it as an “adult time-out.” You also have to get up out of Shavasana and sit. In fact the seated pose is the king of all yoga poses; it is the supreme physical accomplishment. 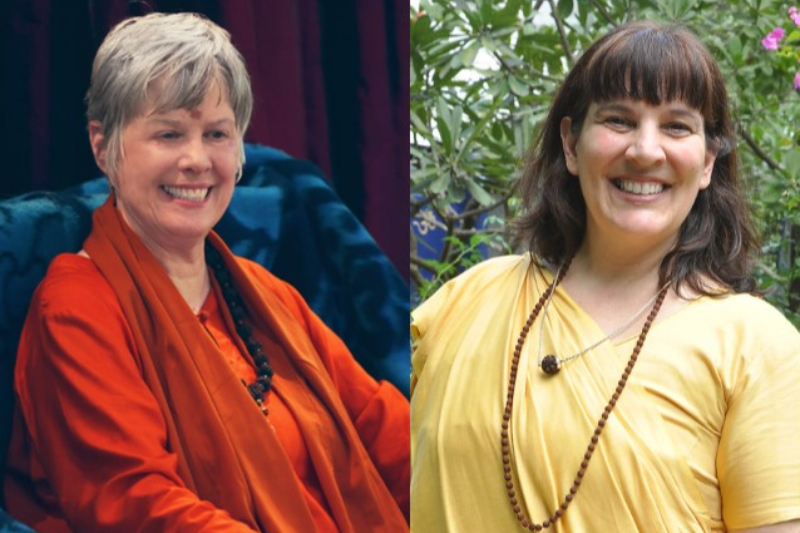 Swami Nirmalananda reports on a national yoga conference she attended. Medical researchers were giving slide shows summarizing their research on yoga, each one having 20 minutes to educate all of us. My airplane was late, so I sat at the back of the hall, behind 2,000 yoga teachers. I was horrified to watch them wiggle and squirm through the second presentation. Before introducing the third presenter, the emcee announced, ‘We’ll have a break soon. I know you can’t sit.’ Don’t they know that the purpose of all the asanas is to make you able to sit? Asana (the seated pose) is motionless and comfortable. This is why Svaroopa® yoga teachers emphasize the seated poses. In Teacher Training, we begin with seated poses in our first immersion, Foundations, returning to them many times in the two or more years of training. Our final module focuses again on the seated poses, precisely because they are the most important poses. Pose by pose, Svaroopa® yoga unravels the deepest layers of tension in your body, tensions that you’ve been accumulating for years, for decades, even for lifetimes. These tensions and blockages have made you tired and cranky, literally bent out of shape. Each time you dissolve these core tensions, you are gaining more of the healing benefits of the poses: increased strength and flexibility, improved balance and posture, reduced stress and anxiety, normalized blood pressure, stabilized blood sugar, better bone health, younger spine, improved immune system, better sleep, enhanced focus, uplifted mood, deep sense of well-being, peace of mind, increased happiness. All of these and more are yours when you make yoga a regular, ongoing part of your life. The benefits of yoga are truly amazing. And meditation offers even more. This entry was posted in Mystical Living on March 31, 2019 by Swami Nirmalananda.